More than 200 kindergarten through 12th grade teachers recently attended the seventh annual EXSEED Conference at Loma Linda University where they had the opportunity to dissect sharks, catch rainbows with pizza boxes and interact with a Loma Linda University sea turtle researcher in Honduras via Skype, among dozens of other workshops and experiences. EXSEED stands for Excellence in STEM Experiential Education, and was developed to qualify more teachers to effectively teach in the areas of science, technology, engineering and math. 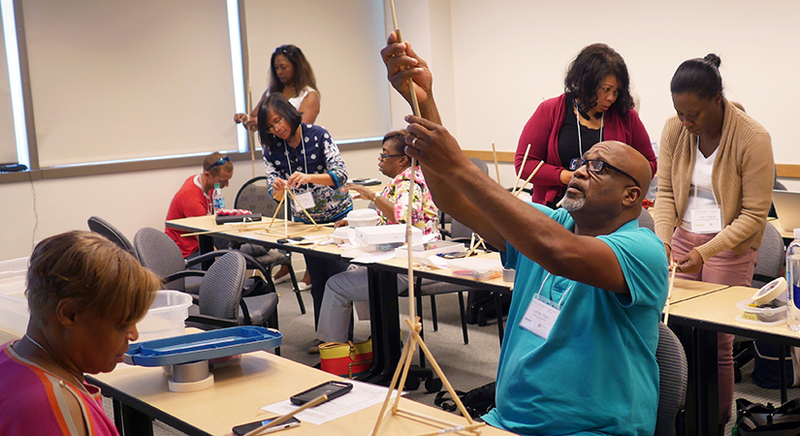 More than 40 hands-on workshops took place during the conference, each offering mission-focused, integrative activities that could be implemented in the educators’ own classrooms. The conference was held June 19 to 23, followed by a second session June 26 to 30 for teachers and pastors from the Oregon Conference of Seventh-day Adventists. Retired high school biology teacher Nikki Gonzalez, MA, taught workshops during both sessions. During a workshop titled “By design; science labs debugged!” Gonzalez used everyday items such as eggs and yarn to show participants how to teach science on a budget. She also led the teachers as they completed a lab that is in a science textbook used by many of the participants — dissecting a sheep brain. Research shows that if children haven’t developed a foundation in math and science while in elementary school, it is unlikely that they will be successful in graduate or professional health science programs, according to Marilyn Eggers, PhD, co-executive director of EXSEED. Faculty from the university’s School of Medicine have shared findings from research studies with Eggers revealing that students need to have a firm understanding of math and science by the sixth grade to be successful in medical school, while School of Dentistry faculty cite study findings that show dental students must have the same strong grasp of math and science by grade five. Richard Hart, MD, DrPH, President of Loma Linda University Health, said EXSEED was launched as a contribution to the development of outstanding science educators for the Adventist K-12 education program. “We are continuing to build the program with the goal of contributing to a functional kindergarten through graduate Adventist educational system that connects teachers and students in small, rural schools to their nearest Adventist academy and higher education partners depending on their needs,” Hart said. This is the second year that a separate EXSEED Conference was held for teachers and pastors from the Oregon Conference of Seventh-day Adventists. There are 31 K-12 schools in the conference, serving 2,350 students. In 2015, Adventist schools in Oregon were losing 100 students every year, and Adventist churches in the state had become stagnant in growth, according to Gale Crosby, MS, vice president of education for the Oregon Conference. In response, the conference held a summit for Adventist pastors and educators at the Sunriver Resort near Bend, Oregon. Crosby invited Hart and Ronald Carter, PhD, provost at Loma Linda University, to address the 400 attendees. “During the summit, Drs. Hart and Carter caught the vision of the conference’s theme ‘Together as One’ and invited the Adventist pastors and teachers from throughout Oregon to attend EXSEED,” Crosby said. Thirty Adventist pastors and all 175 elementary and high school teachers from Adventist schools in Oregon traveled to Loma Linda in 2016 and 2017 to attend the EXSEED Conference. Their participation not only helped to fulfill the desire of Oregon Conference leadership to train Adventist young people to meet the medical needs of our world, the conference is also helping more of Oregon’s Adventist students become prepared to enter medical training at Loma Linda University, Crosby said. The impact is already visible, Crosby said. “Following our conference participation in EXSEED, enrollment has stabilized in our schools and our churches are showing signs of growth,” he said. Laura Bowlby, MA, teaches up to 20 students in a one-room school at Madrone Adventist Elementary in Cave Junction, Oregon. “EXSEED opened up my world and gave me tools to teach my students relevant information they can use in real-world situations,” she said. Doug Havens, MS, director of EXSEED, transports conference attendees to and from the airport, and he is often the first person from Loma Linda University they meet. During the ride to Loma Linda, Havens said he listens as the educators wonder aloud if they will find the conference useful. “Then, on Friday after EXSEED ends, one of my great rewards comes as I hear them describe how the sessions and workshops they attended will change the way they teach,” Havens said. Historically, EXSEED has no program parallels in supporting and mentoring K-12 teachers in the Adventist Church educational system. “With the involvement of Loma Linda University and multiple other Adventist institutions of higher education and their STEM and other faculties, EXSEED has provided teachers the latest and best in scientific information and STEM teaching methodologies to engender critical and analytical thinking and to be innovators and problem solvers” said Carter, Loma Linda University’s provost. EXSEED would not have been created without the significant philanthropic commitment from Tom and Vi Zapara, according to Rachelle Bussell, CFRE, Loma Linda University Health’s senior vice president for advancement. This article was written by Nancy Yuen and originally appeared on the Loma Linda University Health website.